Since our last post, we’ve settled into Barcelona, where we’ll be working for the remainder of the internship. We’ve reached a point where, save a few outstanding design decisions, we’re ready to execute the website and publication. In the past week, we’ve finalized the logo and new content organization system, and began building the structure of the website. LTM’s new logo. The backwards arrows harkens to an older technology, as well as the battle that skeptics of high-tech solutions face. A website mockup that will continue to evolve. Recognizing the increasing difficulties of succeeding in the magazine realm, Low-Tech Magazine’s founder has decided to publish a book instead of an on-going, design-intensive publication. This decision opens up the possibility for us to go deep into certain design decisions that would be more labor-intensive and/or too difficult to sustain for a periodical. For example, we’ve been exploring setting some of the book’s text with a typewriter or printing it with a dot-matrix printer. The typewriter would require more labor on our part as it is much faster to set text in InDesign, but it would allow us to use a forgotten low-tech machine that would minimize the use of our energy-intensive computers and free us from being tethered to walls through a charger. The dot-matrix printer prints with small dots instead of full swaths of ink, ultimately saving ink by leaving small gaps that today’s laser and inkjet printers fill in. We’ll be testing out these low-tech alternatives as well as a few others in the coming days to see if and how they can be integrated into the book design. We have a number of time-intensive tasks ahead of us (migrating over 100 articles, color-treating hundreds of photos, etc. ), but we’re really exciting to have arrived at this state of execution. At every stage, we’ve been able to further our research into low-tech printing and web design, and we’re looking forward to consolidating these findings (some of which we’ve detailed in previous posts) once we get back to the US. I came to Washington, DC with the overarching goal of merging my interests in industrial design, urban studies and public policy. Now, one month into my time here, the most central realization I have is just how desperately these disciplines need each other and how resistant people can be to interdisciplinary approaches. All festive and on the way to the DC Senior Symposium! My first weeks were filled with tabling events at the Senior Symposium, University of DC Institute on Gerontology Health and Wellness Informational Fair and the Housing Expo, while struggling to gain a sense of direction. During these weeks I worked alongside Age-Friendly DC’s three interns to compile Washington DC’s first report for the World Health Organization (WHO). The report serves to maintain the District’s status, earned in 2012, as an Age-Friendly city. Each week has a different focus related to a domain used in the report to the WHO. The focus during my first week here was on Communication & Information and the second week’s focus was on Civic Participation & Employment. In Leah Erica Chung’s talk, Why Designers Need to Run for Congress, at Better World by Design 2016, she spoke of her experiences as a designer working in government—a path she started down through a Maharam Fellowship. During her talk, Chung mentioned that when you are a designer working in government, you should never introduce yourself as a designer. Why? Because people will ask you to take their work and make it look pretty. Nine months after hearing Leah Chung’s advice, I forgot it and made this very mistake. I was consequently asked to make a 4’ x 8’ poster for Age-Friendly DC and the WHO’s presentation at the International Gerontology Conference in San Francisco. The content was better suited for a book than a poster. In addition to working on the poster, I also used the third week as a chance to take a step back and recognize that my assignments did not complement my Maharam goal. The point of this fellowship is to relate my discipline to a non-design field—this mission could not be accomplished with the original tasks I was assigned. However, my experience with the poster did familiarize me with the preconceived notions people have about designers that cause their involvement in government to be the limited and often purely aesthetic. Now that I am more aware of where familiarity with designers’ skills is lacking, I feel better prepared to propose more solutions for this knowledge gap. Going forward with my time here, I decided to diverge from the collection of information to be used in the WHO report and proposed several projects that would better combine my industrial design background with urban studies and public policy. These projects include a press kit, event kit, redesigned logo, alternate engagement materials and a branded template for the WHO report. Each week one of the interns is selected as the “team lead,” tasked with the job of being the main point of contact between the Age-Friendly DC supervisor and all other interns. I will be the team lead for the weeks and domains of Outdoor Spaces and Buildings and Housing, in addition to working on my proposed projects. I’m finally getting adjusted enough here to blog about it! Hello, all! For July and August I’m excited to be out in Arizona, working at Biosphere 2. B2 was built in the 1980s to test the possibility of using large enclosed environments to propel people further into space, using the natural world as a life boat. For 2 years, from 1991-1993, 8 scientists lived inside the totally closed system, growing their own food, making sure the world ran right, and becoming national media sensations. After that experiment, and an additional one, the facility actually fell into disrepair for a number of years. For the past decade, the University of Arizona has been running it, not as a closed system anymore but as an active research facility for Earth Science and education. The whole thing feels similar to a trip to a botanical garden, with an extra layer of utopian dreams and Buckminster Fuller designs. Some immediate highlights include discovering the old Bat Cave, where 5 bats were supposed to live in the Desert Biome, helping 6th Grader’s catch plankton from the Ocean Biome in boats, and encountering my first rattlesnake last Thursday! I didn’t get bit, and apparently, the larger ones can’t kill you as easily anyway so I had nothing to worry about! One of the lungs, regulating the air pressure of the facility when it was a closed system. I essentially have three jobs here, and I’ve been referring to myself as the Guinea-Pig-Artist-In-Residence. The first is exactly that, to do as an artist does in a new space, take in the sights, reflect on it all, produce some work, and show it off. That’s been an interesting endeavor so far as I’m without any usual facilities for doing that. I found a rusty hammer in the Rainforest Biome the other day and it has become a good friend for building sculptures! I’ve been doing a lot with my hands, making some smaller works from beeswax and thorns. I also signed up for a membership at a local ceramics co-op studio in Tucson, where I’m learning some intro things and finding time to produce some more refined pieces! Everything is moving so quickly that I’m feeling like the work I make is going to be a collection of sketches and exercises, and it’s a refreshing way to work through ideas. My second job is to interact with all of the other people around Biosphere. These groups are essentially the daily visitors, misc visiting groups, middle and high school programs (each a week long), and the researchers here for the summer. My interactions so far have included shadowing a group of 6th graders that were visiting from the Arizona Sonora Desert Museum, as they took soil and water samples around the facility, screening a video work to a different group of students that were here for a weeklong summer program, and leading a workshop on Cyanotypes to a group from the Phoenix Zoo. My Final task is to record all of this and find a way to make it more regular at B2. The funding for an annual residency just isn’t here yet, and my experience would not be possible without the Maharam. But my coworkers at Biosphere and I agree that B2 needs a regular, annual artist-engagement initiative, and that has become the biggest challenge so far. Taking a small amount of money, and finding a way to bring in fantastic artists every year that will grow from the experience, and engage with B2’s visitors in new, exciting ways. The workshop was exciting and the conversation we had around conservation was one I don’t get to find at RISD easily. I brought up some artists I’m looking at for leading successful projects, including John Gerrard, Agnes Denes, Coral Morphologic, and Mel Chin, and showed my previous work as well. Cyanotype composition by one of the people in my workshop today. Pollinator LOVE! For the next week or two I’m focusing more on the body of work I’m producing because ideally, I have it installed for a show here ASAP, and can talk about it while I’m here, and take it down and home with me when I leave. Then later in August I’ll finish putting together plans for the future of artist-engagement here at Biosphere 2. It’s a lot more work than I expected but I couldn’t imagine being happier doing anything else! Not so long ago, my grandparents house had a fully functioning vegetable and fruit garden in the middle of a city. My parents home, even now shares a boundary wall with the State Zoo (it has a larger breeding space inaccessible to visitors)- which means spotting elephant, deer, monkeys and birds from their home windows. When I moved from there, I went to a design school built in the heart of yet another bustling city, which was a pit stop for migratory birds, had its own resident dogs, monkeys, snakes, peacocks and a turtle which would slowly make its journey from one end of the campus to another. I take the time to write all this because it illustrates a permeable relationship between developed settlements and their natural surroundings. To me, there seemed to never be a need for a boundary. But now that I look objectively, the idea of demarcating human territory has been growing all around me. To further understand and explore these ways of co-existence, after all these years, I moved back to Guwahati. Now that I am settled here, let me take you through a bit of my research so far. To make one slightly familiar with the structure of the city, here’s a map of Guwahati, with the varying population density, it’s mighty river, islands and other green patches. I am two and half weeks into the fellowship and under my supervisor’s guidance I have been moving around the city, documenting locations where certain fauna can be spotted. I was super excited to do this, as inspite of having lived in the city, I did not know about most of these animals and birds living in the same space as me. Here’s another map to help put this in context. Most green patches here are hills, which have preserved much of the habitat for the proliferation of urban fauna. But this proliferation is not without it’s difficulties. In the past two weeks I have learned to look up at trees and spot nesting birds, to critically look at temple ponds which lack enough land surface for turtles to lay eggs, or even surprisingly come across the Greater Adjutant Stock, the most endangered species of its kind (only 1200 grown individuals are estimated to exist worldwide, 800 of which are said to exist in Assam). On a more positive note below is an image of a temple pond being altered through the efforts of the organization I am working with, Help Earth, to create some accessible soft ground for turtles to lay their eggs (this is marked as the turtle pond in the map above). After extensive surveys, local experts suggest that this pond houses 10 species of turtles, including the Assam Roofted Turtle and the Black Soft-shell Turtle (which has until recently been considered extinct in the wild). This effort does not suggest any hindrance to spatial development, but simply a request to include nature as a part of the built human environment; not as an afterthought but woven within the very fabric of it. While the above is a parallel project I am getting to learn from as my supervisor works on it, I have been myself working on a taxonomy book on Amphibians of Guwahati and getting my head cracking on ways to entice the local government into starting a campaign revolving around the conservation of local urban biodiversity. Between designing t-shirts and posters, my supervisor has also given me the freedom of working on an educational project of my own choice and design. For the initial week, he imagined me working on an activity book for school students to increase awareness and conversation. But eventually when he saw some of the work that I have done so far, he was intrigued by my idea of a Museum in a Box. I offered to create a Museum of Local Urban Biodiversity which pops out of a small box. Having played with this concept earlier at RISD, I am super excited to take this idea forward. The idea has been brewing for sometime, I have been creating prototypes and content simultaneously and look forward to sharing it here in the coming weeks. More visual content with some urban fauna of Assam coming in next time as well. Until then, let us all learn to look up once in a while to spot these creatures who share our cities with us. Southside Community Land Trust is a non-profit organization in Providence that is dedicated to helping people in Southside gain access to locally produced, affordable and healthy food through urban farming. They have locations scattered around the greater Providence area, but originated in the Southside and continue to have their focus in that neighborhood. One of their many programs is the Youth Employment Program. Using mostly funding from state grants, in addition to private donors, the organization is able to employ twelve high school students to do work in farming, outreach and education. Just a year ago, SCLT acquired a plot of land dedicated just to youth development. It is called Somerset Hayward Community Farm and it is a quarter acre of land that is mainly dedicated to the youth employment program. I’ve included a map of the area in this post because for me, location was one of the first things that struck me about Somerset Hayward. The plot is on the corner of Somerset St. and Hayward St., just one block from the main road, Broad St. We are across the street from the back of the Salvation Army, one block from McDonald’s and KFC, two blocks from a liquor store that opens in the early morning, three blocks from the social service agency, Amos House, six blocks from the vibrant Davey Lopes Recreation Center and we are surrounded by ten plus vacant houses. As you can imagine, the Somerset Hayward Community Farm is a busy place with a lot of people passing by each day, asking questions, giving feedback (mostly positive) or simply observing us working on the farm. There is something very refreshing about receiving such constant and direct feedback from a community while in the middle of a work day. These past two weeks, I have been orienting myself at the organization, learning about youth development, planting and education. Starting Monday, the returning youth staff begin their summer schedule where they will spend time each week working on the farm, assisting with growing lessons at the Davey Lopes Recreation Center as well as the Center for Southeast Asians, going on field trips to learn about food systems and lastly coming up with and executing a group capstone project that is fully theirs. In brainstorming with my supervisor, Laura Bozzi, we decided that the capstone project would be the best area of focus for this fellowship because it remains an open part of the curriculum where I am able to contribute in a way that would be significant. I began to think of different projects we might do that could incorporate design/build techniques, but kept feeling like any idea I had might be an imposition on the youth staff rather than something constructive. Eventually it occurred to us that one of the biggest things I might have to offer is my design process itself. My goal for this summer is to distill my design process into steps and to use that structure in guiding the youth staff through the design and execution of their own group project. It will be interesting to see how the design/build process can be applied to a student project in the field of food systems and community outreach. Constituent outreach at Sankofa Farms Market on Elmwood with my co-worker Zainab! talk, act, make is a super simple way to explain my process of understanding and destabilizing conditions for change (which is what I invariably want to do with everything). For complete disclosure, I stole this off a precollege kid’s t-shirt yesterday so jokes on you. For my Maharam so far, I focused on the talking. Talking during meetings with Department of Planning and Development, talking to constituents when answering the phones (and trying not to drop the call when transferring them), talking to my coworkers to understand where they come from and what lovely people they are, and talking to people outside of the process (mainly my roommates as we make family dinners) to make sense of what I do every day. At this point, talking has lead me to a ton of interesting places. One of the most unexpected topics is considering the impact of unionized workers in the context of innovation. How do you reframe unions and job positions to create the best conditions for people? Honestly, I don’t expect to tackle that problem, but it would be a cool project! Talking has also lead me to reach out to some of RISD’s past Maharam Fellows for insight into how they utilized design thinking within their organizations. At this point in my Maharam, I am approaching a pivot, where I transition from talking to action! I’m very excited to actually start doing things and not just absorbing. I have a couple of small projects I’m doing for MCCS, but I have two big ones in the works. My first project is creating and facilitating a Design Thinking Workshop with my team. My goals are to explain what I do as a ~designer~, show them a bit of how to think through things from a design perspective, expose them to jargon-less communication, and get their ideas on how to make MCCS a better system. My second project beings to address another goal of my Maharam. I was drawn to 311 because fundamentally it is a medium for people to communicate with their government. In that vein, I am researching how the ‘conversations’ (reporting cases) can be expanded to be included in the Department of Planning and Development’s process. This is a department removed from day to day services, responding to longer-term problems, and so they haven’t had conversations about 311 yet. As I look towards the end of the summer I am excited for the final stages of my Maharam, and for the possibility of integrating actual making. At this point, it might take the form of programmatic or structural design, but we will see! As the Zero-Footprint Campus project wrapped up, we have been transitioning out of the Netherlands to settle in Spain, where the rest of the project will take place. In the process, we’ve been discovering the challenges of low-tech travel: clunky bike-sharing systems, the reduced availability of night trains, the expenses of high-speed trains, and country-specific regulations and processes. We’ve been discussing an identity system to launch for Low-tech Magazine. 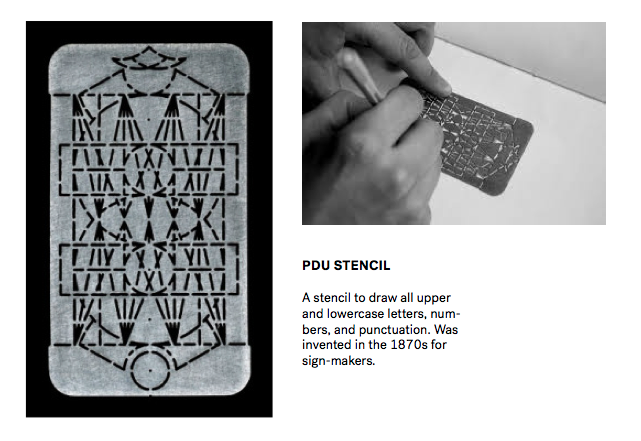 Below are a few of the initial sketches where we focused on the a typographic system that embodies historic or alternative type-drawing technology, whether it be the PDU stencil system or calligraphy. With some feedback, we are revising our next round of designs to include more pictorial elements and quieter typography. With Low-tech Magazine, a platform that has never considered design, there is a sense that the “default” design, the status quo is sufficient. But in the same way that the articles question progress in high technology, we’re working to question how its current design of the blog, consisting of “default” choices, can be better tailored for its mission. “Default” is hardly neutral, and is comprised of a series of design decisions made by individuals that may or may not aid the readability of the site’s content. Our challenge is to make an identity that aligns with the low-tech values of the site, both in its construction and its aesthetics, while also being mindful of the high-tech forces behind a lot of system defaults.